Not to be confused with World 1-2, Level 1-2, or Stage 1-2. Area 1-2 is the second course of Coaster Hills and the second course overall in Mario vs. Donkey Kong: Mini-Land Mayhem!. It introduces Girder Pickups, which must be collected by Mini Mario and co. before they can be used as Red Girders. 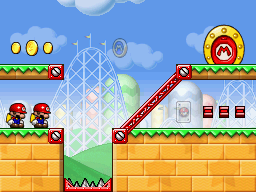 Both Mini Marios begin on a platform on the bottom left, with the exit door on the top right. In order to reach it, they have to head right and collect the Girder Pickups, then place a Red Girder slope over to the top left and construct a straight Red Girder bridge right to the exit. The M-Token is located at the top of the level. It can be collected simply by constructing a straight Red Girder bridge just below it once the Girder Pickups are collected. The Mini Mario Card is located directly adjacent to the Girder Pickups. The Mini Marios should be guided to it by placing a Red Girder bridge just over the Spike Trap.